With the rapid response and plethora of entries received for the last 2 competitions held, a similar trait was found. Loyal fans hear their favourite Producers & Vocalists share their deepest thoughts on every episode, the fans now wanted their chance to feature on their favourite show. This competition was spurred on by the allegiant fans, it`s prize, the ultimate deserved accolade for one lucky fan. Jes, Betsie Larkin, Ferry Corsten, Zara Taylor & More!! Win your chance on this acclaimed podium !! 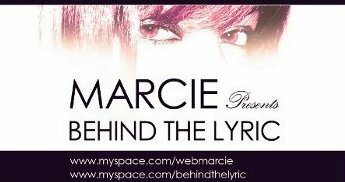 At fans request, Marcie is allowing one lucky fan the chance to use their voice on her celebrated radio show, "Behind The Lyric". This one is too easy, all you have to do is answer the following question: "Which trance event in Utrecht will be Marcie be doing live vocals at in April?" Share your opinion about your favourite tune on Marcie`s Show, let the trance public hear your voice!! All Entries Must be Received by March 30, 2010.